Newly elected councillor of the Aranaputa/Upper Burro Burro NDC, Virgil Harding during his visit to the Department of Public Information (DPI). Newly elected councillor of the Aranaputa/Upper Burro Burro Neighbourhood Democratic Council (NDC) Virgil Harding says he has “big plans” to further the development of his community. The Aranaputa/Upper Burro Burro Village in North Rupununi, Region Nine (Upper Takutu-Upper Essequibo) is the newest NDC created by the Coalition. This area is made up of three constituencies of about 110 residents who participated in the recently held Local Government Elections (LGE). Harding, who has resided in the community for over 25 years and was the candidate for A Partnership for National Unity (APNU), emerged the winner of Constituency Three at the LGE; along with Adon Jacabos, Constituency Two and Leona Brummer-DaSilva of Constituency One. 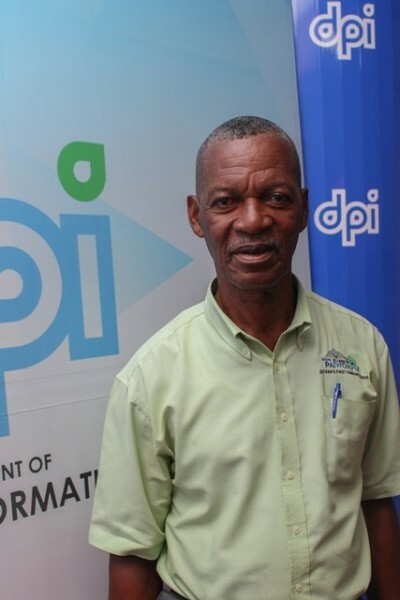 He sat down for a one-on-one interview with the Department of Public Information (DPI) today. Harding, who is grateful to his fellow villagers for having elected him outlined a number of plans for his area, one of which is the establishment of a daycare centre for young working mothers. He also has plans to furnish the community sports ground so as to facilitate competitive football games. “I’m hoping that during my tenure I will be able to help the parents of young children by creating a daycare centre… The young people are very involved in football. The government had fenced the playing area but we want to introduce the youths to night-playing and so we need lights.” He also pledged to improve the potable water system so as to ensure each household receives water through their taps. In the long term, Harding said the NDC will be working to regularise the land leased to villagers. This, he explained, will enable villagers to fully utilise their lands for agriculture and other activities.